In 2008 my friend Kevin Daniels, a climber and a publisher of outdoor books, asked me if I would be interested in making a climber’s guidebook for The Needles. I thought about it, and I was confident that I was familiar enough with the area to do the project justice. “Give me two years”. I thought that was more than enough time. I started work the next year. Finally, in August of 2016, the book went to the printer. What took so long? I spent lots of time taking photographs of the formations. I worked hard to get some points of view which climbers would not ordinarily see including aerials from a small plane. I collected stories and historical tidbits from Needles climbers who led the way. I researched the history of climbing at The Needles; many great climbers have contributed to Needles climbing by doing standard setting climbs. Then I set about creating accurate and sometimes entertaining written descriptions of each and every climb. The book also covers The Needles stately neighbor to the south, Dome Rock, and their sister crag standing alone to the north, Hermit Spire. Why put so much effort into a project like this? It won’t be on any best seller lists, and lots of information about the area is available online. What can a book offer that the internet sites cannot? It can offer completeness and context. I’m a history buff, and over a period of more than 50 years adventurous climbers have left us a rich history of accomplishments at The Needles. Early pioneers explored the wild granite spires without keeping accurate records. An occasional old piton, or a pile of stones on a summit say “We were here before you”. Beginning in 1969 with the efforts of climbers including Dan McHale and Fred Becky, climbing at The Needles was defined by the day’s best climbers setting new standards. I gathered stories, comments, and recollections from many of these climbers, and included them as sidebars or in route descriptions throughout the book. This is one way to put Needles climbing into context. The book also features numerous action photos by masters in the field including Greg Epperson, Kevin Powell, and Jim Thornburg. Another thing you won’t get from websites is a complete list and description of every climb at The Needles, Dome Rock, and Hermit Spire. Since these sites are built from the contributions of individuals, climbs which are rarely climbed for a variety of reasons get left out. My book details every climb which has been established at The Needles to date. Many of these climbs which have fallen into obscurity are terrific. So the book should entice climbers to broaden their horizons, to seek out adventure and do more than just the most popular routes. These were my primary goals in making this book; to create a historical context, to include action pictures by top photographers of the sport (visual context), and to place the popular climbs into another kind of context: their surroundings. 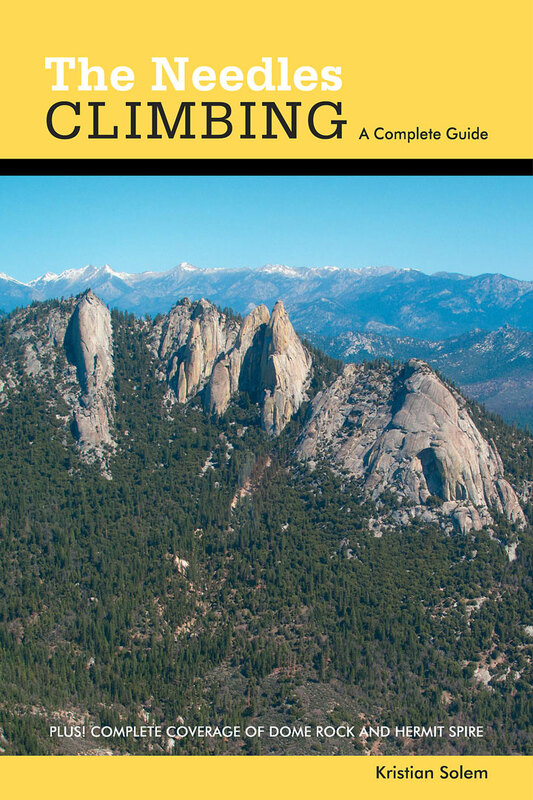 And of course it also has to be an accurate guide, a resource climbers can rely on. I had to decide how much detail to offer. A guidebook is expected to show how to get to the area and where to camp. It should show where any given climb is, what route it takes up the rock face, and give a reasonably accurate level of difficulty. If a climb requires highly specialized techniques or gear, or is exceptionally risky, this should be made clear. Lastly, details of the descent can be valuable. These are the basics. I think that the names of first ascent parties are important information, others dispense with that. 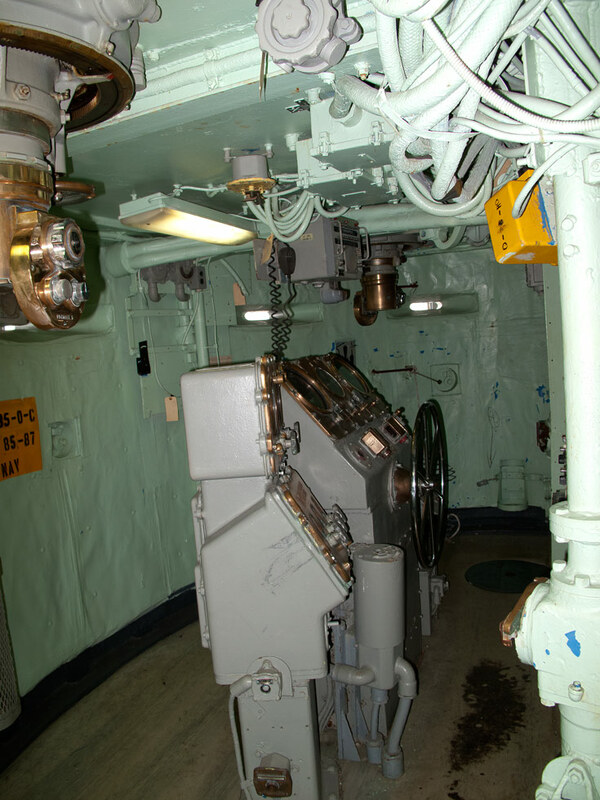 Many authors go into great detail, providing lists of every piece of equipment, perhaps even where it will be used on the climb. Some books even tell climbers how to do the hard bits. I chose to stick with the basics in my book for a variety of reasons. 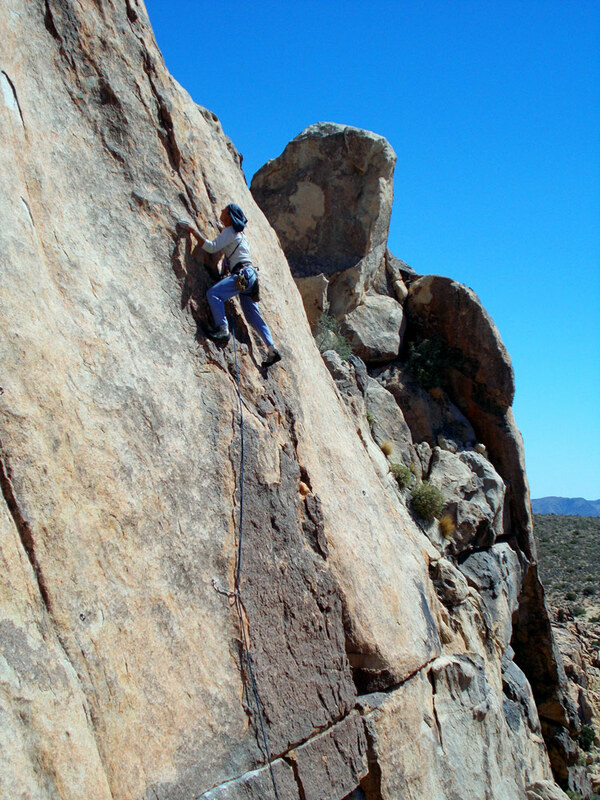 The nature of Needles climbing is such that no two leaders will protect a pitch the same way, and different parties often belay in different places. And the easiest way to have errors in a book like this is to give too much information. The Needles offer adventure climbing, and I was not about to make a book which dumbs the place down. Back in L.A. on Thursday I had my weekly session at Core Conditioning with my teacher, Roger. We have an interesting relationship since it is both professional and personal. I pay him as a teacher / trainer, and we’re friends. I’ve introduced him to climbing, which he loves. So, when I showed up for training and told him I’d just been out climbing for most of the week he was of course happy for me, but I could see by the look in his eyes that I was about to be tested. He had me start with the usual warm ups, but added interest to the roll up / roll down series by mixing in a roll over each rep. Then he had me do the “Footwork” on the Cadillac, a setup which puts me in a confined position, testing my flexibility. It was immediately obvious that four days climbing, hanging from my hands and standing on the tips of my toes for much of the time, had left me with a shortened superficial back line (calves, hamstrings, back and neck.) At first I could not hold a neutral spine, but it felt great to get the stretch and arrive there. Next we moved rapidly through a series of more advanced exercises, and I noticed that we skipped over the strenuous “Series of Five,” sometimes called the stomach series. I was expecting he would throw this at me late, when tired, but he upped the ante by asking for a full set of “Teasers” (a very demanding core move,) transitioning from rolling like a ball without touching down. I focused on breathing well and floated the teasers in good style, but they wiped me out. We finished our hour with some demanding back extension work on the chair, side lying legwork in springs on the Cadillac, and wound down with the push through bar. Well the last two weeks were a lot of fun punctuated by moments of stress and one calamity. Oh, and did I mention no real training or serious exercise. I have a brother who lives in France with his family. Our parents, who are octogenarians, live in a retirement community in Pasadena, not far from here. The brother, named Crane (after the author of “The Red Badge of Courage; Stephen Crane) and his teenage son came over and stayed here for a while. Of course it was a very big event for our parents as it is any time they get to see their far flung son and grandson. We made the most of it. 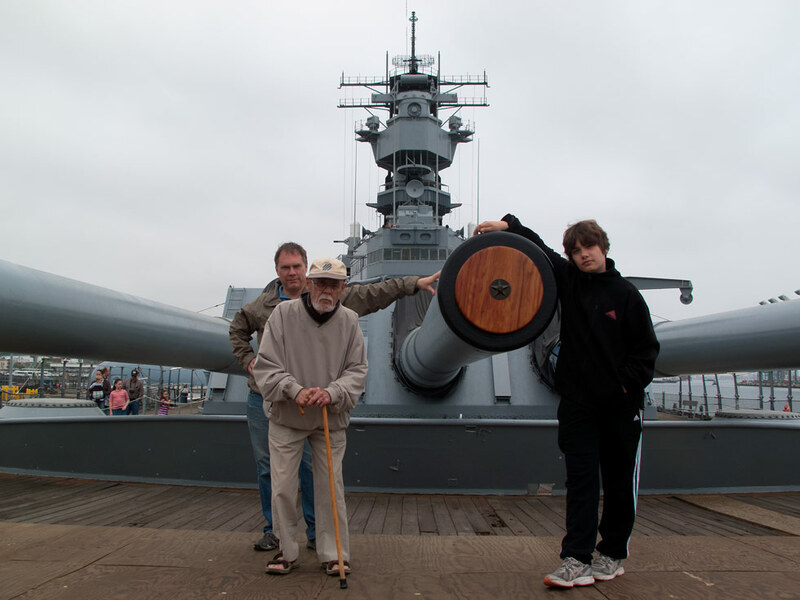 We had a few good outings, spending an afternoon touring the WWII battleship USS Iowa which is berthed as a museum ship in Los Angeles harbor. 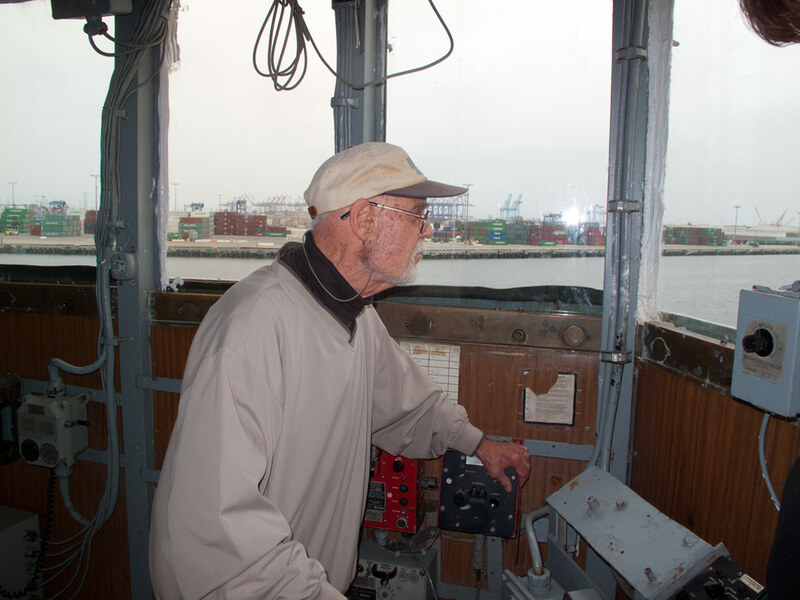 Our dad was a navy man in the 1950s, and seeing him standing proudly on the armored bridge of the great battleship looking out to forward as if we were underway was quite stirring. These French are unbelievable, everything revolves around food and wine. Crane, my brother, took over my kitchen. He is a wonderful cook. He would serve up breakfast, and while eating “petit dejeuner” the conversation would turn to the menu for lunch! And any time left after cooking and eating had to be spent shopping for more food. And wine. And shopping is like doing a big wall. First the menu and ingredients are decided upon, but when we get to the market the planned ingredients look less than perfect. Now begins an endless process of inspection, re-planning the menu, and improvising. And then there is shopping for wine. Food is food, but the wine is serious business. We have a local chain called BevMo, which stocks thousands of wines including many French. I think in the last two weeks we paid their rent. It was wonderful and I have no regrets, but I feel fat and wasted. It was epic. Now I’m back on a diet and fitness is job one. Got crushed in Yoga class last night. Pilates tomorrow with Roger, better get 12 hours sleep tonight. Since my last post I finally got in some time actually doing the sport I train for, rock climbing. Last Saturday I drove out to Joshua Tree National Park and camped with several friends and American Alpine Club members. Sunday we went to a climbing area there called the “Hall Of Horrors” and did about a half dozen good climbs. The first lead, our warm up route, was mine. The climb was an easy classic, “Lazy Days,” 5.7. Since I have not climbed any rock for several weeks due to travelling and other demands, I felt a bit wooden at first. By the time I was halfway up the climb I felt great. It was a stellar day with many more good climbs. Monday and Wednesday I went climbing with a legend of the sport, Phil Bircheff. Among Phil’s numerous first ascents was his 1976 climb, along with Dave Bircheff and Jim Pettigrew, of the classic “Lurking Fear” on Yosemite’s grandest monolith, El Capitan. 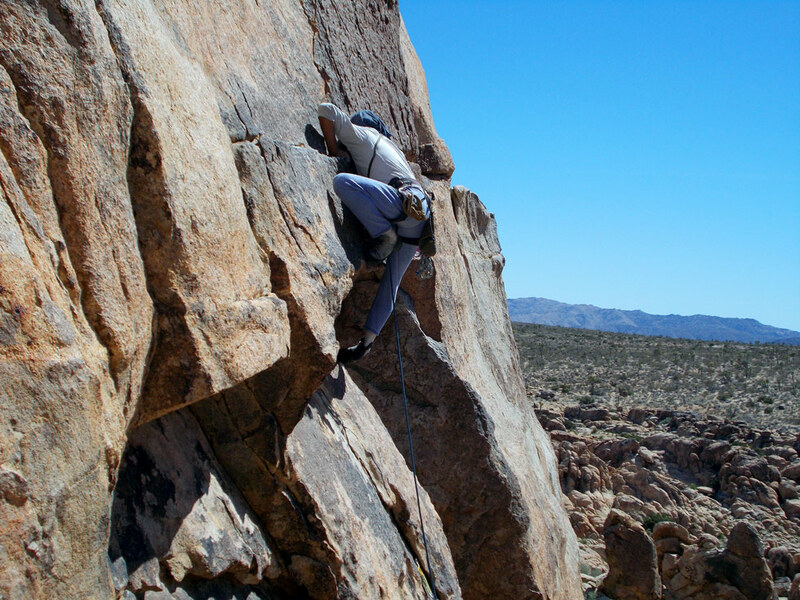 This climb is done in 18 pitches, ascending more than 2000 feet of vertical granite. Phil is 64 now, sports a lean and sinewy figure, and regularly out-performs climbers who could be his grand kids. Tuesday Phil and I were joined by Cole Gibson, a local climber and talented video producer. Wed. 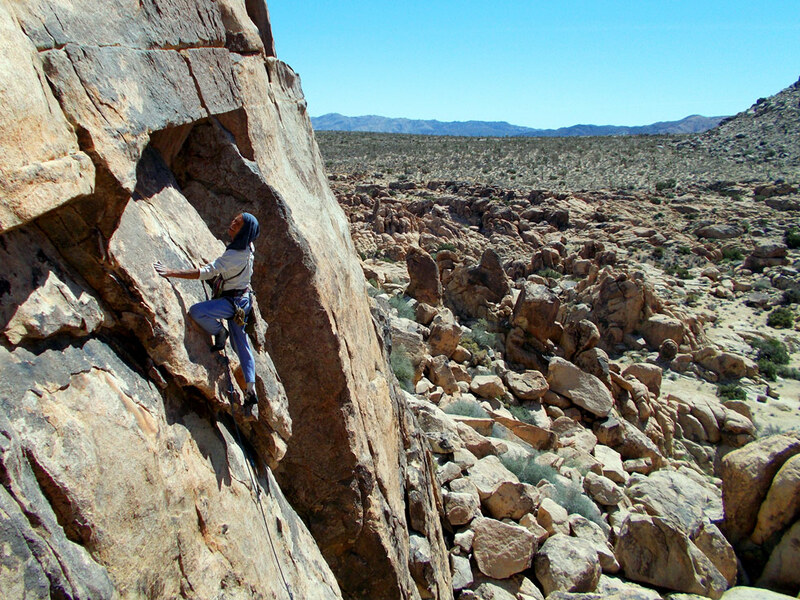 I went out again with Phil, and he showed me the “Wailing Sax” wall, a cliff in Joshua Tree I have never climbed (there aren’t very many of those). It was great! Here’s a couple shots of Phil leading a runout 5.10 climb called Maiden Voyage. Phil is also an outstanding artist. 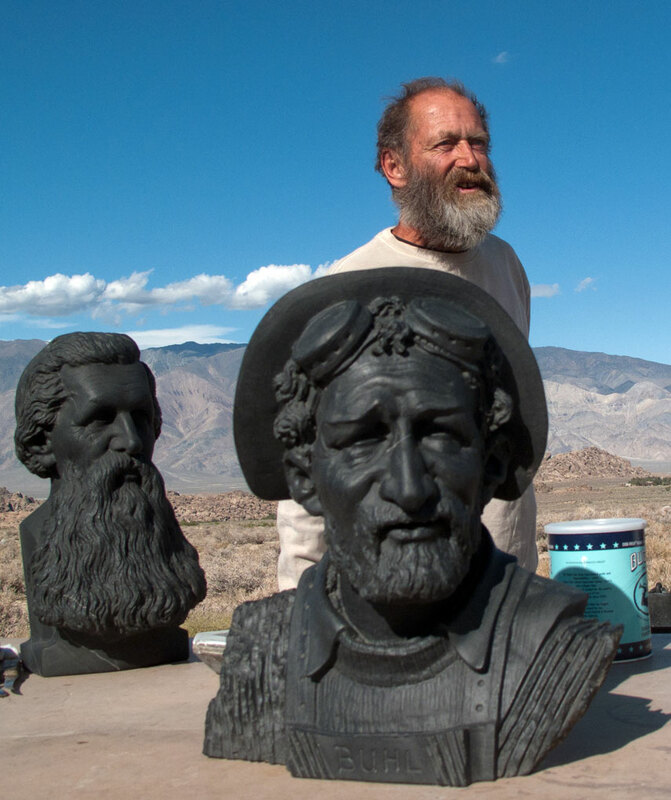 Here he is at Tuttle Creek Campground with statues he carved from black marble he quarried himself of Legendary mountaineer Hermann Buhl, and John Muir.